The Alpha Wolf represents the core values we strive for every day: kind., compassionate, and gracious. Last year, during the Alpha Wolf ceremony, Mr. Kuiper was talking to Mr. Doyle as the presentation was happening and he thought that maybe we could do more as a school. We shouldn’t just celebrate Alpha Wolves twice a year but acknowledge them every day. “It’s great if you get picked but there are people who aren’t chosen but are Alpha Wolves,” Mr. Kuiper states. The purpose of the Alpha Wolf Committee is to create a conversation around the core values of our school. During meetings, students are able to express their feelings on what they would want to change at school to make it a better place. Also, students get to share their personal stories and people are free to ask questions towards the person speaking. Mr.Kuiper developed a program called Stories of Us where students gather in the media center to hear stories of Wyoming High School students. So far, Mr. Kuiper has seen the impact of the Stories of Us, which is what will be starting soon. The Stories of Us has taught students to be open and become more sensitive to other people around them. It also creates friendships that no one would have thought possible. It gives students a chance to have a voice in terms of their own personal life. “Listening is an important part of the Stories of Us,” states Mr. Kuiper as he speaks of the way students have changed from being in this program. The Alpha Wolf Committee is made up of a diverse group of students from sophomore to seniors. The committee is for everyone. “There are no cuts, and you don’t have to apply,” said Mr. Kuiper. All students are welcome. There is no limit to the number of people who join. If someone wants to be in this group they have to be willing to be open and listen to others. 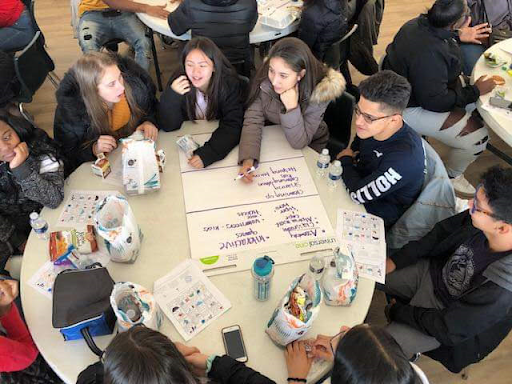 At the committee’s recent trip to Camp Blodgett, they talked about the core values of what Alpha Wolf is and reflected on what they will bring back to WHS. These students brainstormed things that our school does well and what we need to improve on. Taejah Cross, a sophomore who went on the trip,had a great experience. She didn’t just learn about others but discovered things about herself as well. She got the chance to reflect on her life and figure out why she does the things she does. The best part of the day for her was when other students got to share their stories with the group. “We have a lot of different stories in our school and kids with hard times become the strongest leaders. They put others before themselves even when they are struggling,” states Taejah Cross. Ivy ly, another student who had the opportunity to attend this tremendous field trip, realized that she thought she knew people and found out that she only knew a small part of our school. For her, this field trip was an eye opener as to who she was friends with and the people she could have been friends with if she just would have talked to them. The trip took her out of her comfort zone. She was able to meet new people she probably would never have met if she hadn’t gone to Lake Michigan that day. Attendees mentioned that they wanted to bring Alpha Wolf outside of Wyoming High School, that they wanted our elementary to hear about this too. They talked about creating a song about Alpha Wolf with John Angotti, a singer that came in and sang for one of the recent Alpha Wolf awards. “The younger kids view Alpha Wolves as heroes and learning about it would make it much better to appreciate,” states Ivy ly. The best part of Ivy’s day was the pictures she got to take with all the new people she met and laughing with each other as if they had been friends for a long time. Learning about other people is always good because once you hear their story you might just find that you have common issues, so you don’t feel like the only person in the world that thinks something is happening to them. Reflecting back on the things, members found that everyone has their own story, and that realization makes them more thoughtful of what they do and who they judge. Also, they saw if they branch out of their social circles we can help people and benefit from others in the process.